“Bobby Tarantino II” is Logic’s seventh mixtape release (Photo courtesy of Def Jam). 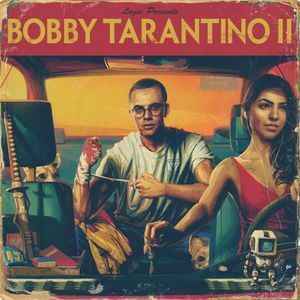 Two years ago Logic released “Bobby Tarantino,” a mixtape that he described on the project as being “for the party,” contrary to his albums being “for the spirit.” That mixtape preceded his third and most recent album, “Everybody.” Now following his third album, Logic has decided to bless his fans yet again with another pre-album mixtape with “Bobby Tarantino II,” and just like his last mixtape, this sequel is definitely made more for the party than the spirit. Days before the release, Logic had some help from his pals Rick and Morty in announcing his new mixtape on social media. This hilarious bit has made its way onto the intro of “Bobby Tarantino II” with Rick telling Morty off about how “Mixtape Logic” and “Album Logic” are two completely different people. It is hard to disagree with that, because sometimes it is nice to skip the deeper message and just, “…turn some s*** up,” as Rick so delicately puts it. Once Rick and Morty throw the new mixtape on the listener hears “Overnight,” one of the tracks Logic released in the week preceding the album. This track epitomizes the Mixtape Logic mentality of being the life of the party, with some killer production from longtime Logic producer 6ix and some insanely catchy lyrics from Bobby himself, “Tell me is it really so hard? Really so hard, to be a good person? Tell me is it really so hard? … I treated everybody with respect and now I’m rich.” Who else has ever rapped about making it big by treating everybody with respect? Seriously, name one rapper… The world needs more people like Logic in the rap game spreading this kind of positivity. Though things are kept pretty standard here for a Logic mixtape, there are still some nice surprises to be had. “Midnight” is a cool track that splits itself into two parts: one part a slow club track, and second part a braggadocio-filled outro. “Warm It Up” feels like a throwback to Logic’s earlier mixtape days stating, “They want the old me, they want the Young Sinatra back,” bringing the classic Logic flow his fans love along with some moments of that iconic verbal-machine-gun spitting that helped make him famous. “Yuck” is the biggest surprise on the album with Logic seemingly touching on the beef between Joyner Lucas and himself. Logic goes in on this one and does not hold back (too much), “Peace, Love, and Positivity, that’s all I want with you, but you push the issue cause I give you more press than your publishers could ever get you.” The track concludes with a voicemail and it’s from… Elton John?! Whoa. It is crazy to see Logic go from a rapper blowing up in the college music scene, to a Grammy nominated rapper and live Grammy performer getting calls from a music legend. “Wizard of Oz” is the highlight on the mixtape with 6ix’s hard bass perfectly complimenting Logic’s high energy. The vibe is aggressive and highly entertaining and is perfect Logic Mixtape material. Seriously if you’re looking to “turn s*** up” like Grandpa Rick is, then look no further. Logic once again quenches the thirst of his fans that are already in high anticipation of his fourth major album. And once again, he is delivering a solid project to turn up to; nothing more and nothing less. It is important to note that Logic usually only comes out with one major project a year, so his fourth album most likely will not see the light of day until 2019, but in the meantime, “Bobby Tarantino II” is here to ensure that one’s car speakers will be filled with some of that hot fire until then.